Hi everyone! Happy 2018! Some 'trends' are fleeting (Beverly Hills Hotel palm frond wallpaper anyone?) and some last the test of time and become something more than a trend. I think that dark walls are here to stay. Sooooo in light of that revelation, I wanted to share some of my thoughts on how to navigate this trend and how and where to take the plunge. One of the reasons I chose this topic is that I am going to be transforming our entryway and I feel like I am finally at a place where I have the confidence to go dark. So in my planning of this dark and moody entry, I done some research and thought that I would share it. If you aren't quite sure if you want an entire room dark, then start with either an accent wall or a very small room like a powder room shown below. By starting small, you can then decide then to either paint the rest of the room (after the one accent wall) or if that's all the dark you can handle - leave it at that. 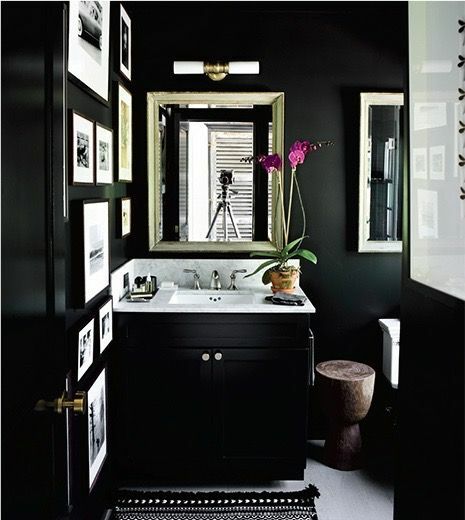 With a smaller room like a powder room, the dark walls allow you to give maximum impact for minimal space. I am going to be painting our entryway black and as it's a very small entryway and only has 1 wall, I figure it's the perfect place to start. I am also thinking of going with a high gloss/lacquer look for even more of an impact but this is yet to be determined. Next, keep the color palette pared down. Woods and brass look fabulous against the dark contrast, as does certain colored stone (marble/quartzite). For pops of color go with fuchsia pink or mustard yellow or even Kelly green. But avoid having to many different colors. I love the use of the different textures above. The black crocodile wallpaper is to die for. Mixed in with that sheepskin rug and a few tiny pops of color, this space is heavenly. I just want to curl up on that sheepie and have someone strum that guitar and send me off to design bliss. But that's exactly what an amazing image of a space you love should conjure. You should be able to see yourself in the space living in that moment. Dark walls - Mixing textures, patterns and eras to create a statement. Image via Pinterest. So I am just at the start of my journey into going dark and as my new entryway unfolds, I will blog along and show you how it's going. If you have been playing around with interior design and home decorating and are starting to feel confident about your style but also feel like you need a change, then try going dark. Remember... you can always repaint that wall white if you absolutely hate it. But I have a feeling you will love it.